Born and raised in Canton, Ohio, Kelly Williams displayed talent at a young age. “When I was only three or four years old, I would sit on the floor and bang on the pots and pans,” he explains. A good student, Kelly’s parents got called to school only when Kelly was acting up for his classmates. It would be a talent that would he would capitalize on at the tender age of seven. “The Gong Show held auditions at my school and I was selected.” Kelly became the youngest contestant to win the popular television talent show. “I knew that my only options were to work in a factory, pursue music or sports, or wind up in prison. I tried all of them,” tells Kelly. Over the years, Prodigal has opened for a variety of artists including R. Kelly, Trina and Busta Rhymes. His first CD, Rhythm and Street was nominated for a 2009-2010 Stellar Award and was named 2010 S. Florida Gospel Rap Artist of the year. 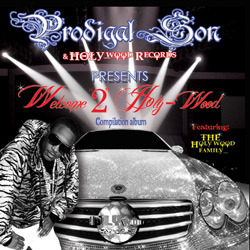 Prodigal has formed his own record label “HOLY-wood Records” with his last release Kingdom Swagga-nomics making its way to #21 on Billboard’s Gospel Music Charts for the week of August 21, 2010. His latest compilation project, Welcome 2 Holy-wood features Wen, Vell P., Hall of Faith Saints, Cameron Joy, Voice, BI-Lingo, Cataz and Renegade of The King and was inspired by God. “I had never heard of Moses when God told me to be a “Moses” to other artists and to bring them out. It was a couple of years before I even read Exodus and realized that God was referring to all the people who had come to me for help producing their projects,” he states. Even the consultant he hired encouraged him to produce the compilation project. “The consultant told me he didn’t know why but this would be successful for me. It has been so interesting to be a part of these artist’s efforts,” he adds.